How many times do we pass something every day and never pay it any attention? How often have we passed by a demolition site of an old factory, for example, and think "ARGH! I always meant to get a photo of that!" - and now it's too late. Hopefully, it only happens to you once or twice before you learn your lesson and get your photos when you can. Unfortunately for many of us, we're still learning that lesson. That's when historical research can really help fill the gaps. I - as well as my friend John Wallace - rode/drove over the Old Main Street bridge over Goff Brook in Rocky Hill dozens, if not hundreds, of times. Unfortunately, neither of us got a photo of the bridge before it was recently rebuilt. Here's what it looks like today (scroll to the bottom of the post), but what did it look like in 1947? Nobody knows for sure - at least nobody I've talked to so far. 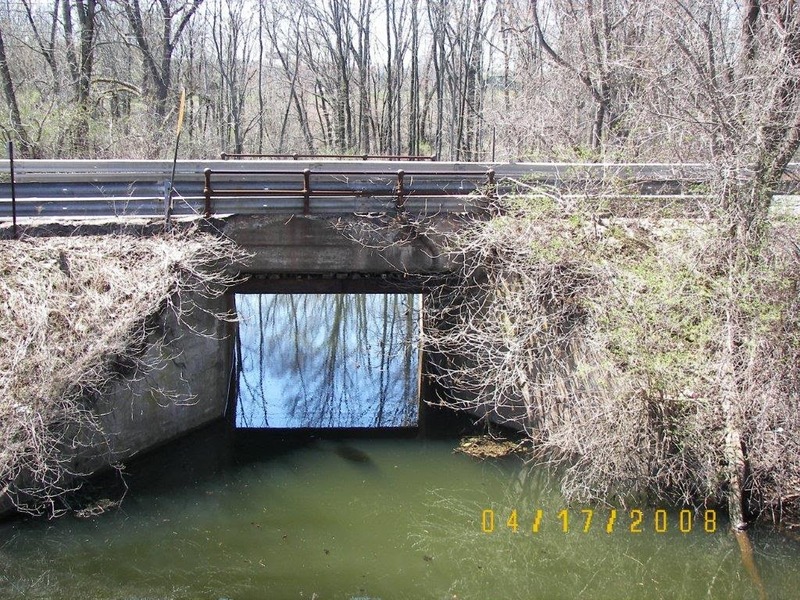 Earlier this year, I'd contacted our state DOT in hopes that they had some historical photos of the bridge (since it used to be the Middlesex Turnpike and the main road between Hartford and Old Saybrook), or at least a photo of it before it was rebuilt. They directed me to the Town of Rocky Hill since, now downgraded to local road status, the town would have done any upgrading. So last week I finally got around to checking with the Rocky Hill Public Works Department - and got a little breakthrough. The department head was actually on his way out for the day when I caught him, but he was intrigued with my project (after being initially concerned why I wanted such information) and - best of all - he said he'd taken a photo of the bridge before they started the repair work. He assured me that "only from the deck up was done" and that "the deck and abutments are about 90 years old." Yesterday, he emailed me the photo he took . . . While all I can be sure of is that this is how the bridge looked as of April 17, 2008, unless/until I get any additional photographic evidence to the contrary, I'll assume this is how it looked in 1947 (but without those modern guardrails, natch). JohnW, for his part, said he expects this is what it looked like - and that's good enough for me, for now. But that won't keep me from following up on just one more lead - a fellow at the Rocky Hill Historical Society who I'm told has a "treasure trove" of Rocky Hill images. Who knows, I may just be able to get an even older photo of this bridge after all. Of course, if you have - or know where I can get, an older photo, please let me know. In the meantime, anybody have any ideas on what to use to model those cool railings? Maybe some O scale steam locomotive stanchions?